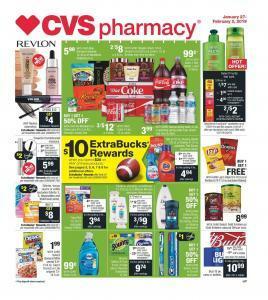 Let's begin the weekend with CVS pharmacy deals and grocery low price offers. CVS is the best place to find all your health needs and weekly grocery needs together. If you have prescriptions and no time to shop your home needs from another shop, you're very lucky. Everything you need is available at CVS. Please check CVS Weekly Ad Deals Jan 27 - Feb 2 2019 to get the lowest prices. Beauty and health is the most important subject to care about for both men and women. But of course women tend to take care of their beauty a bit more. So there are lots of makeup choices from many brands. At CVS stores, you can find high quality makeup for affordable prices. Revlon, Maybelline, Covergirl, Loreal are the main brands on sale this week. Another important thing is to support your health with daily vitamins and supplements. You can also find many kind of vitamins in this ad. Most of the times, there is buy one get one deal on vitamins so it's a good idea to stock some up. When it comes to groceries, check out wine offers first. You can even find options for only $10.99 and all are high quality wines. As Valentine's Day is not far, this ad includes pretty cool chocolates and treats to surprise your loved one with an affordable gift. In addition, microwave pizzas, pringles, coke and other TV snacks are on sale if you like to spend some comforting evening in front of TV. Page 6 is totally about beauty products for your skin and hair. Check out moisturisers, shampoos, deodorants, shower gels and more. Take a quick look at page 7 if you dye your hair at home and don't want to pay too much money to hair saloons. On page 10, cold season drugs are for very low prices. See other drugs available prescription free. There are eye drops, gas relief meds, cortizons and many other pills on page 12 and 13. Vitamins are buy 1 get 1 free so it's better so stay healthy and consume your daily vitamin needs. Don't forget to support your digestive system with probiotics indeed.